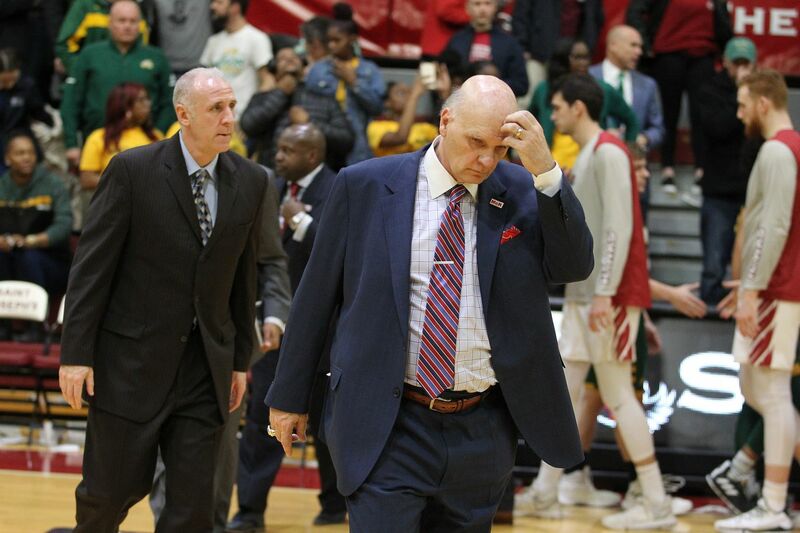 Coach Phil Martelli, center, of St. Joseph's walks off the court after their 85-60 loss to George Mason on Jan. 3, 2019. St. Joseph’s had to believe the aberration would stop. George Mason was not a great three-point shooting team. Entering Thursday’s Atlantic 10 opener at Hagan Arena, the Patriots were shooting 32.8 percent from beyond the arc, which ranked 244th in Division I. Still, in the first nine minutes against the Hawks, GMU drained seven of 11 shots from deep. The Patriots’ range seemed to extend to City Avenue. Then, suddenly, their range barely extended beyond 5 feet, and they missed five straight three-point attempts. Unfortunately for St. Joe’s, the treys came back for the Patriots in the second half, as did lay ups and midrange jumpers. The only shot George Mason didn’t make was a dunk, because the Patriots didn’t try one. Holding the Hawks scoreless for nearly six minutes, GMU blew open a close game and crushed St. Joe’s, 85-60. Jaire Grayer, left, of George Mason strips the ball away from Charlie Brown, center, of St. Joseph’s during the 1st half on Jan. 3, 2019. Leading 57-54 midway through the second half, The Patriots (7-7, 1-0) put together a 19-0 run on their way to dealing the Hawks (7-7, 0-1) their worst loss of the season. Led by Justin Kier, who made four three-pointers, the Patriots had four players sink at least three treys. George Mason had a season-high 15 threes and shot 53.6 percent from deep. Kier led the Patriots with 18 points and 14 rebounds. Otis Livingston II scored 17 with seven assists. Charlie Brown, Jr and Lamarr Kimble each scored 17 for St. Joe’s, but the Hawks shot just 34.6 percent for the game and made just six of 24 shots in the second half. St. Joe’s committed 13 turnovers and gave up 15 offensive rebounds, with led to George Mason taking 22 more shots. Jared Bynum, center, of St. Josephâ€™s gets sandwiched between Otis Livingston, left, and Jared Reuter of George Mason during the 2nd half on Jan. 3, 2019. “The 51 points in the second half,” Hawks coach Phil Martelli said. “Our defensive numbers had improved so much, but a 51-point half. Then the numbers – 11 first-half offensive rebounds and shoot 25 percent [second half] at home. This game was far different than when the Patriots beat the Hawks twice last year with regular-season buzzer-beaters. This time, George Mason had deep reserves on the court for the last few minutes. Charlie Brown, left, and Anthony Longpre of St. Joseph’s in the final minute of their 85-60 loss to George Mason on Jan. 3, 2019.